Tennessee’s capacity for addiction treatment is lower than the demand and out of sync with the geography of the opioid epidemic. Coverage and payment practices by private insurers, TennCare, and the state’s safety net influence treatment capacity and individuals’ access to treatment. Assessing current practices and additional strategies may require a comprehensive, multi-stakeholder review that includes the state’s public and private payers. Reducing the demand for opioids will involve a comprehensive and coordinated spectrum of efforts to promote health and well-being, prevent substance abuse and opioid misuse, and treat drug addiction. 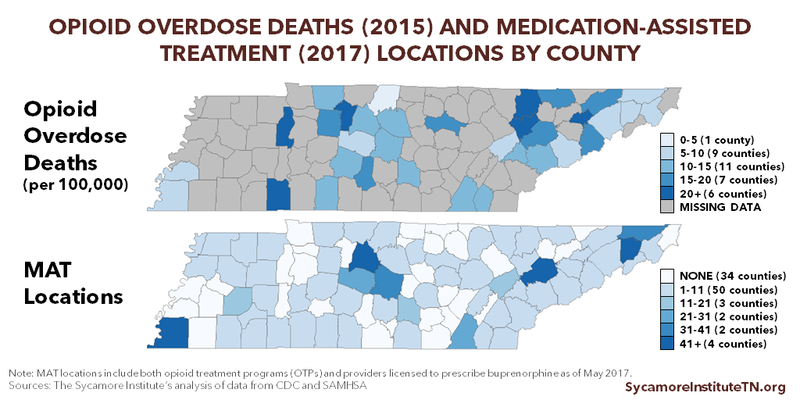 The third installment of our 3-part series on the opioid epidemic, this report examines the environment for preventing and treating addiction in Tennessee and provides examples of additional strategies that could help prevent opioid misuse and improve Tennesseans’ access to evidence-based addiction treatment. Both health promotion and addiction prevention efforts include activities that are typically “upstream” where they address the drivers of health. Prevention efforts target the risk factors and protective factors associated with drug addiction and abuse. Substance abuse prevention has evolved over the years from “Just Say No” and the fried egg analogy to efforts that focus on the often complex underlying issues. Tennessee’s Building Strong Brains initiative aims to address adverse childhood experiences (ACEs) and other sources of childhood toxic stress that are risk factors for substance abuse. These efforts help build resilience — a protective factor against addiction — during early childhood and adolescence, a critical time for human brain development. Tennessee has enacted a number of policies to limit the supply of prescription opioids, which is an important part of preventing opioid abuse and addiction. 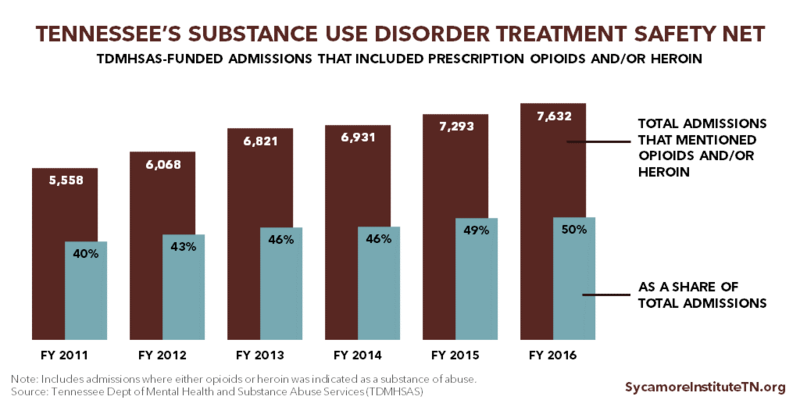 In recent years, Tennessee has adopted nearly all best practices by expanding the use of its controlled substance monitoring database (CSMD), publishing prescribing guidelines, and regulating pain management clinics. Effective treatment and recovery programs often include medically-assisted detoxification, counseling, and medications that are tailored to individual needs. Tennessee has undertaken targeted efforts in recent years to increase screening for substance use disorder (SUD) and to expand opportunities to refer individuals with SUD to treatment. Treatment is only available to the extent that providers and services exist and are accessible to the individuals who need them. In 2016, an estimated 61% of Tennessee’s need for behavioral health providers went unmet. 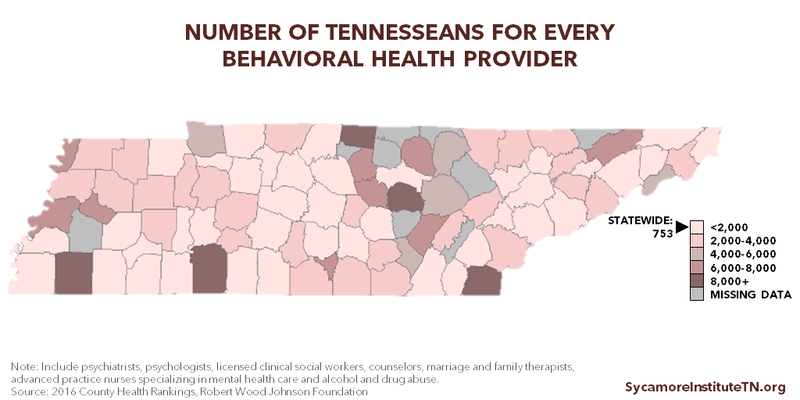 (14) The ratio of residents to behavioral health providers in Tennessee is 753:1 but varies greatly within the state (Figure 1). Addressing coverage and payment policies may require a comprehensive review in collaboration with the state’s public and private payers. Additional coverage-related options are discussed throughout this report. Research has found that a combination of counseling and medication — known as medication-assisted treatment (MAT) — is the most effective approach for opioid addiction. Figure 3 shows the distribution of opioid overdose deaths in 2015 alongside the distribution of locations currently certified to provide methadone and/or buprenorphine. 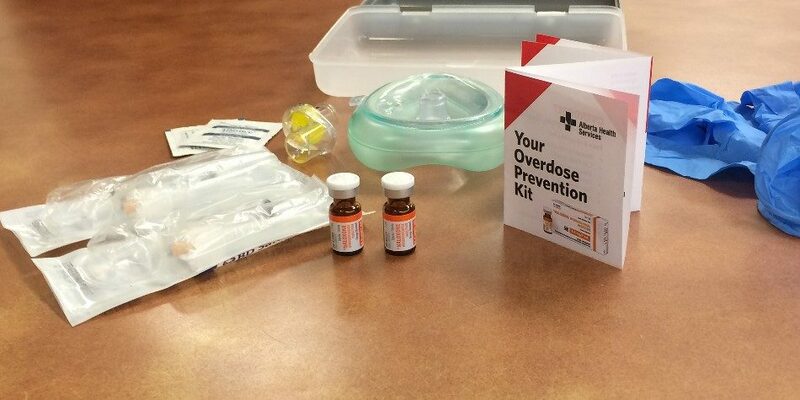 At least 3 counties (Benton, Cheatham, and Marshall) had 15 or more overdose deaths per 100,000 residents but zero MAT locations. 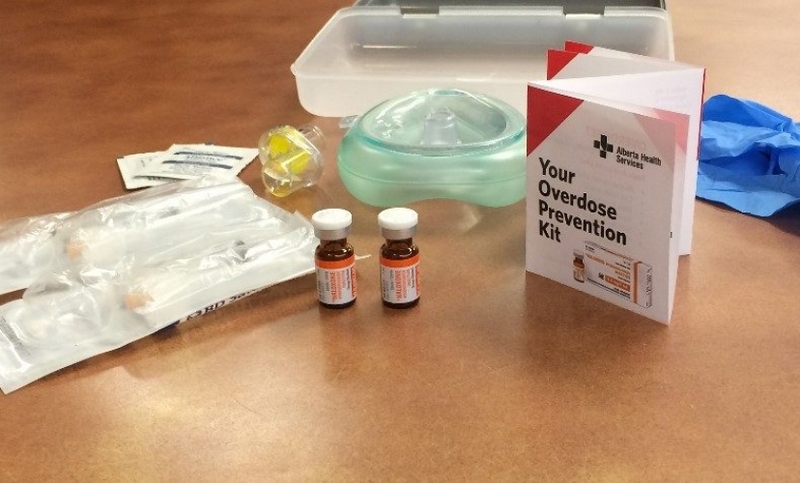 Opioid overdose death rates were not available for 61 of Tennessee’s 95 counties. Federal, state, and local governments fund services for certain low-income adults who are otherwise unable to access or afford needed substance abuse recovery and treatment services. These publicly funded services are often referred to as the safety net. TDMHSAS supports safety net substance abuse recovery and treatment for adults with incomes below 133% of the poverty level and with no access to other sources of coverage (e.g. TennCare, employer-provided health insurance). Between 2011 and 2016, the number of total treatment admissions funded by TDMHSAS increased by 10%, from 14,000 to nearly 15,400. Admissions for opioids and/or heroin abuse increased by 37%, from about 5,500 to 7,600 (Figure 4). TDMHSAS does not publicize waitlist estimates, but a 2016 audit found that the wait time for a detox bed can be weeks. (40) New funding increases should help meet some of this need, but it will be important to track this progress and to plan for a transition when one-time federal dollars are no longer available. It will also be important to study the long-term outcomes of individuals who participate in TDMHSAS-funded treatment. In 2016, the state’s 3-Star Healthy Task Force proposed to cover low-income adults with behavioral health needs via TennCare as a way to address the opioid epidemic and reduce criminal justice costs. An estimated 64,000 low-income, uninsured Tennesseans had SUDs in 2013. (50) TennCare eligibility expansion could increase access to addiction treatment services for many of these individuals. States that have expanded Medicaid have seen an 18% reduction in unmet need for addiction treatment services among low-income adults. (51) The task force’s proposal is on hold while Congress considers legislation to roll back or repeal the ACA’s Medicaid eligibility expansion. 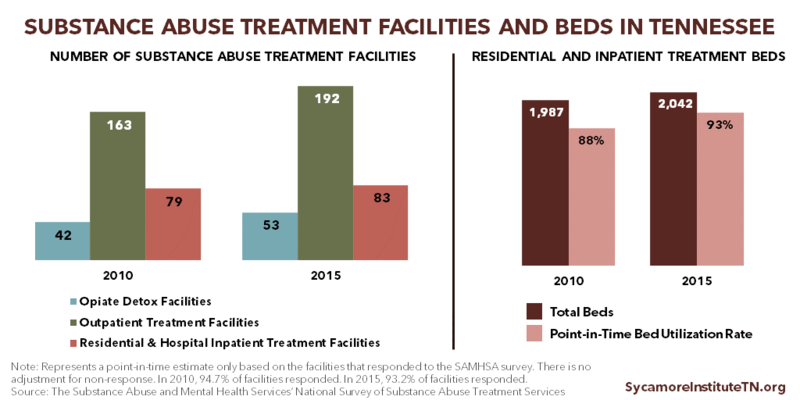 Federal law requires equal coverage for addiction treatment, but public awareness is low and compliance rules may be unclear. The federal Mental Health Parity and Addiction Equity Act of 2008 (MHPAEA) requires most private health insurance plans that cover mental health and/or substance use disorder (MH/SUD) to make those benefits at least as generous as their medical and surgical benefits. 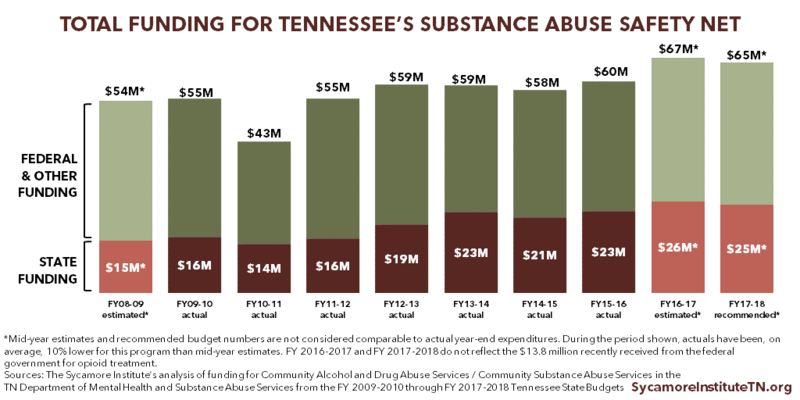 Assessing coverage practices, restrictions, and payments for addiction treatment may address some of the underlying drivers of the state’s provider and MAT capacity issues and comparatively low MAT utilization rates by Tennesseans covered by private insurance (discussed more above). Ensure open communication with insurers on MHPAEA standards and requirements. Standardize materials so insurers know how the state will assess compliance. Create templates, workbooks, and other toolkits for the annual insurer filing process so that data are consistent and compliance is clear. Assess insurer practices and network adequacy to ensure MHPAEA compliance in fact as well as on paper. Several pieces of legislation introduced in the Tennessee General Assembly in 2017 aim to raise awareness of MHPAEA requirements and ensure Tennessee’s enforcement of MHPAEA. SB 839 / HB 1244 would make state insurance law consistent with the requirements in MHPAEA and require the Tennessee Department of Commerce and Insurance to enforce MHPAEA. Senate status: Assigned to the Senate Commerce and Labor Subcommittee / House status: Expected to be considered on the first 2018 calendar of the House Insurance and Banking Subcommittee. SB 835 / HB 871 would require a consumer and provider education campaign on MHPAEA. Senate status: Referred to the Senate Commerce and Labor Committee / House status: Assigned to the House Insurance and Banking Subcommittee. SB 836 / HB 479 would require the Tennessee Department of Commerce and Insurance to put in place MHPAEA enforcement mechanisms. Senate status: Referred to the Senate Commerce and Labor Committee / House status: Assigned to the House Insurance and Banking Subcommittee. TDMHSAS works with the state’s judicial system to coordinate behavioral health care for individuals in the criminal justice system. In recent years, state policymakers have made efforts to expand access to treatment for these individuals primarily through recovery courts. Education about evidence-based opioid addiction treatment such as MAT, behavioral interventions, and other support services could help recovery court judges shape their programs. National best practices recommend that recovery courts provide access to MAT. (6) In some areas of Tennessee, pregnant women have reportedly been sent to a county jail to detox, which puts both the mother and fetus at risk. (63) MAT with methadone (and increasingly buprenorphine) is the standard of care for pregnant women with opioid dependence. If MAT is not available or not wanted by the woman, detox should be medically supervised by an experienced physician. Some studies have found that sudden withdrawal is associated with high relapse rates, preterm labor, fetal distress, or fetal death. (64) Pregnant women, including those in recovery courts, should have access to evidence-based treatment managed by an obstetrician-gynecologist and an addiction medicine specialist. Tennessee has implemented nearly all best practices for reducing the supply of prescription opioids and made some targeted investments in expanding treatment and recovery. Progress has been made, but the negative outcomes of the epidemic continue to mount. As state policymakers mull next steps, they may consider the current prevention and treatment environment in Tennessee and additional national best and emerging practices in these areas. *This brief was updated on Dec. 12, 2017 to correct information about the ability of nonphysicians to prescribe buprenorphine in Tennessee. The Sycamore Institute. Analysis of funding for Community Alcohol and Drug Abuse Services / Community Substance Abuse Services in TDMHSAS. FY 2009-2010 – FY 2017-2018 Tennessee State Budgets and Tennessee Public Chapters 1108 (2010), 473 (2011), 1029 (2012), 453 (2013), 919 (2014), 427 (2015), and 758 (2016). [Online] 2017.